PC version what to expect from next-gen consoles. 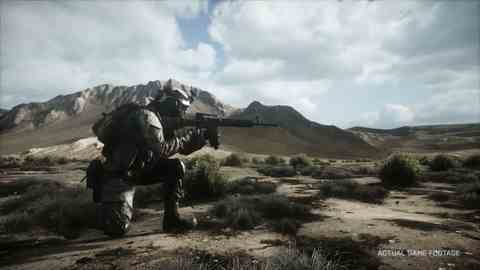 The PC version of first-person shooter Battlefield 3 is what gamers can expect from the next-generation of consoles, developer DICE has said. Amid rumours of a 2013 launch for the next Xbox and reports that publishers such as EA have next-gen kits "on desks", Swedish developer DICE has gone on record to say it already knows what to expect from Microsoft and Sony's next-generation efforts. "If anyone would build a new console today, that would be the result," Battlefield 3 executive producer Patrick Bach told Eurogamer in reference to the PC version of the game. DICE built Battlefield 3 using its new Frostbite 2 engine, designed to future proof the studio and work with the next Xbox and PlayStation. Bach said the next-generation is a case of more horsepower - in particular multiple processors and graphics cards in a single unit. "There's nothing we know about now that the new consoles would do differently, rather do more," Bach explained. "More processors. Bigger memory pools. Everything we have and more. "The big step is to go from single processor to multi-processor. Single graphics card to multi-graphics card. To multi-memory. Do you do multiple memory pools or one memory pool? Since we can handle both consoles now, we control that as well. We have all the streaming systems. We have whatever we might need for the future. "I would be surprised if there were something we couldn't do with the next-generation of consoles." As part of an investigation into the next-generation of consoles, Crysis 2 developer Crytek UK told Eurogamer that visuals achieved using the DirectX 11 graphical benchmark were an appropriate indication of what the next Xbox and PlayStation will be capable of. But with this extra horsepower stuffed inside new consoles, won't they be expensive? Not so, according to Bach. "Remember when the 360 and PS3 came out they weren't as expensive as an expensive PC," he explained. "If you optimise things and say, instead of building 10,000 of these graphics cards we want 50 million of these graphics cards, it's like, wait a minute, we can push the price down to zero. Then you get a cheaper console. So if you take this PC technology and just mass produce it for consoles you will get a much lower price." For now, gamers hungry for the next Xbox and PlayStation will have to make do with the PC version of the game, out in the UK alongside the console versions on Friday. "There's some stuff in here that's truly next-gen," Bach insisted. "A lot of tech stuff, Frostbite 2. Rendering, the lighting, destruction, to me I'm mesmerised no one else has been trying to do it. "I'm looking forward to see if other games can start to do some of the things we're doing. We have some really cool stuff."